Personally signed by the author. All books are signed the same day the order is received. Price includes shipping. Higher price covers our international shipping costs. Canadian customers can order at the $33.00 price since shipping to Canada is cheaper than shipping overseas. 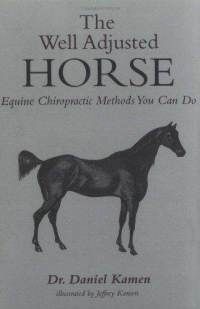 The Well Adjusted Horse (Three Boys Press), by Dr. Daniel Kamen, D.C., details step by step how to perform 36 different horse chiropractic moves. Aside from learning technique, there are detailed chapters on equine skeletal anatomy, case studies, treatment protocol, and case history forms. Best seller. 321 pages. Signed by the author (original signature, not a stamp). These are the actual equine chiropractic moves used by professional horse chiropractors. Dr. Daniel Kamen pioneered many of the animal chiropractic techniques used today by equine chiropractors worldwide. A licensed human chiropractor since 1981, Dr. Kamen has been instrumental in developing equine, canine, and feline chiropractic techniques for over 35 years. He has conducted over 400 hands-on animal adjusting clinics throughout the United States, Canada, and parts of Europe. Dr. Kamen was featured on the front page of The Wall St. Journal for his work in animal chiropractic and appeared on Good Morning America, The Late Show, EXTRA, FOX PET NEWS, and the Disney channel.